At Bodycare, we run our programs the same way professional sporting clubs do. The very best elite clubs are focused on prevention, performing ongoing testing and monitoring of their athletes. If, or when an elite athlete has any minor niggle, incident or injury, be it physical or psychological, they have their team attend to it at the earliest onset by highly trained health professionals. All relevant parties are kept informed, and clear lines of reporting exist to ensure nothing gets missed. Elite clubs put all potential new recruits through rigorous testing. They continue to monitor and survey their employees to ensure optimal health, and as athletes mature they often fill different roles in the organisation, adjusting their individual physical requirements to continue to allow them to thrive. The best companies and our most professional clients maintain a similar approach. Our attitude is that business should respond similarly to ensure the health and wellbeing of their workforce. At Bodycare, prevention is at the core of everything we do. The way we see it, to be a low risk and healthy organisation, health surveillance, monitoring, pre employments and periodical testing is non – negotiable; which is why our brand has become synonymous with Injury Prevention across ANZ. Like professional sporting clubs, we have expert teams and divisions to ensure our programs and services are delivered to the highest of standards and get the best outcomes for our clients. Our business divisions can work independently or collectively to create tailored occupational health solutions that get results. In an environment where workers or candidates, are required to work remotely, drive commercially, interact with the public, perform manual tasks or complete a number of other physical and mental demands, it is critical to ensure that each worker can safely perform the inherent requirements of their role throughout their employment. Our Health Assessments division specialise in the delivery of Pre and Post Employment Health Assessments, Health Surveillance, Periodic Medicals, Health Monitoring and Fitness for Work Assessments/Evaluations. Over the last two decades, we have seen firsthand how workplace injuries negatively impact both the organisation and the individual. Our aim is to prevent workplace injuries and improve overall health by taking a proactive approach to injury prevention. Our Injury Prevention division specialises in the delivery of onsite injury prevention and physiotherapy programs, offsite early intervention physiotherapy treatment, injury management consulting, health and wellbeing and functional fitness programs. We have seen firsthand how poor physical condition can impact our mind. We also know the reverse to be true. 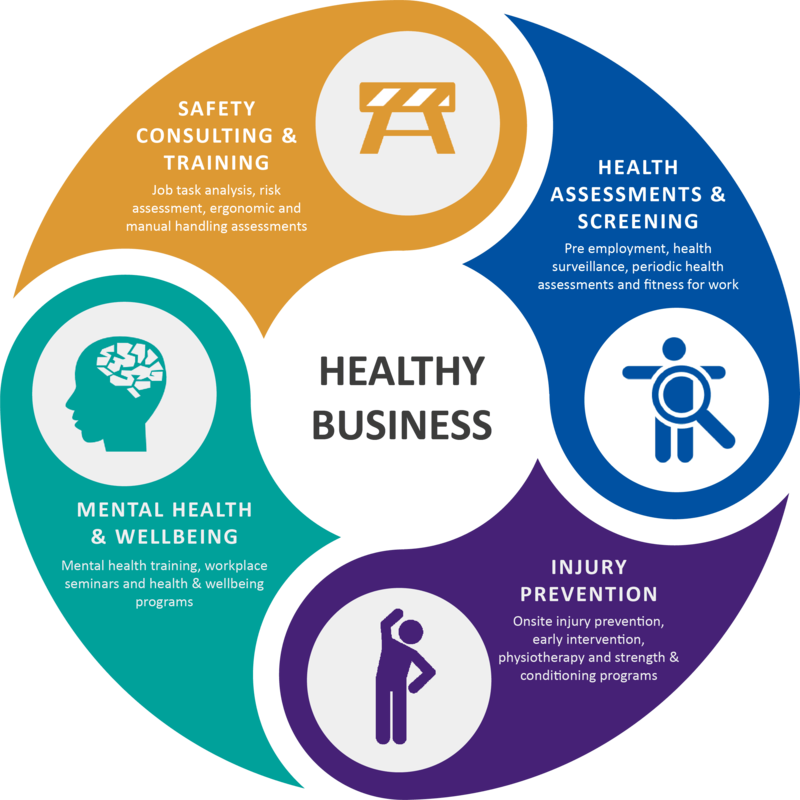 We are passionate about the connection between a healthy body and healthy mind and aim to provide our partners with proactive tools to ensure their workforce remains safe, fit and healthy…in every aspect. Our Mental Health and Wellbeing division specialise in the delivery of Mental Health Training Programs such as Mental Health First Aid, Mental Health Literacy, Resilience Training, Suicide Prevention, Emotional Intelligence, Conflict Resolution along with a variety of wellbeing seminars and programs. The first step towards creating a safe working environment is having the right health and safety policy and processes in place. Our team of occupational health professionals, are passionate about working with you to create tailor health and safety solutions that align with your organisation’s values and objectives. Our Safety Consulting division specialise in the delivery of Ergonomic and Worksite Risk Assessments, Job Task Analysis, Manual Handling Training and Assessments, OHS Auditing, Safety Helpdesk, Virtual Reality Training, Risk Profiling, Drug and Alcohol Management and Policy making.